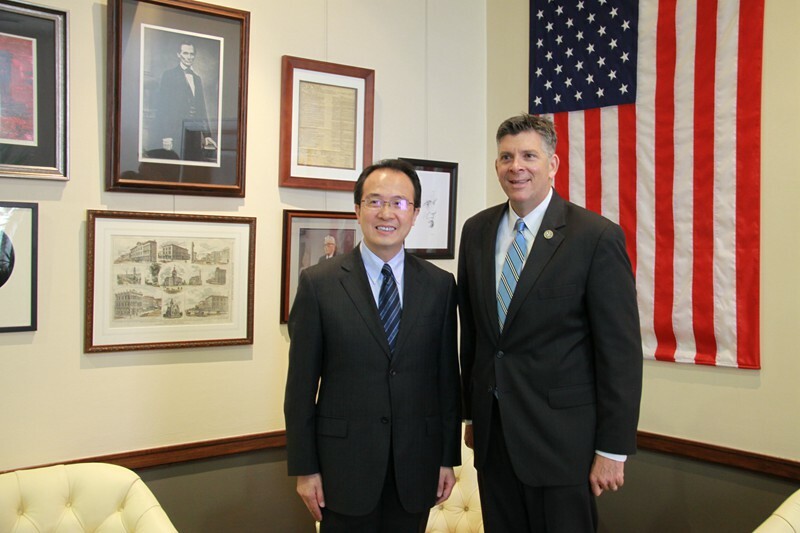 On April 20, Consul General Hong Lei met with Congressman Darin Lahood of the House of Representatives in Peoria, Illinois. Also present at the meeting was Brad Stotler, District Director of Congressman Lahood’s district office. Consul General Hong Lei said that President Xi Jinping held an important meeting with President Trump earlier this month in Florida and pointed out the direction of cooperation for the further development of Sino-US relations. The establishment of four high-level dialogue mechanisms has an important positive effect on strengthening communication and expanding cooperation between the two sides, and will open up a broader prospect for China's exchanges and cooperation with the US Mid-west China appreciates the positive efforts made by Congressman Lahood as the co-chair of the US-China Working Group to promote the development of Sino-US relations and hopes that Congressman Lahood will continue with his efforts to expand exchanges and cooperation in various fields and make new contribution for the development of Sino-US relations. Congressman Lahood said that he represents the 18th congressional district of Illinois which is an important production base of corn, soybean and pork and also home to the Fortune 500 company Caterpillar. President Lincoln once represented the same district as he does. As the co-chair of the US-China Working Group, it is gratifying for him to see that the meeting between the two heads of state has achieved positive results. He hopes that the two sides can strengthen dialogue and communication, and promote bilateral relations to achieve greater development. He said that China and the United States have different social systems, but on many issues they can communicate through dialogue and solve the problems facing the two countries. He fully agrees that the United States and China should become long-term partners and is willing to maintain close communication with China and work together for the friendly cooperation between the two countries.